Bayard Rustin was one of the most influential activists and organizers of the 20th century, and yet many people don’t know his name. 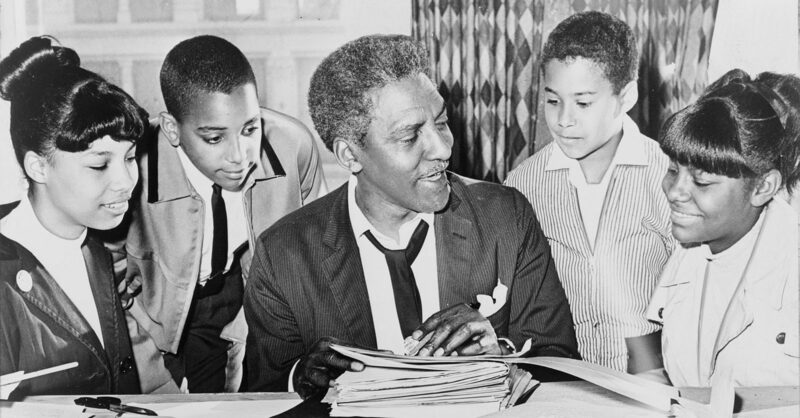 Among many things, Bayard Rustin was the chief organizer of the 1963 March on Washington, and an influential guide to Dr. Martin Luther King’s vision. Rustin was a conscientious objector, nonviolent activist, labor organizer, LGBTQ activist, and international peace advocate who was an openly gay man. 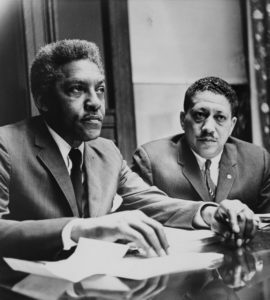 In 1912, Bayard Taylor Rustin was born in West Chester, Pennsylvania. He was primarily raised by his Quaker grandparents, Janifer and Julia Rustin. He shared often how he was shaped by their Quaker values. He grew up having an active childhood, being a member of the school football team, and writing poems. According to legend, organized a sit in at a restaurant that would serve his white teammates, but not him. Rustin attended a handful of universities, Wilberforce University, Cheney State Teachers College, and City College in New York City, where he sang, performed in musicals, and also joined the Young Communist League. As a gay man coming of age in the 1930’s and 40s, Rustin was open about his sexuality long before it was safer to do so. He claimed his Quaker grandmother’s affirmative support helped him live without shame or guilt. Rustin eventually left the Young Communist Party and focused on protesting racial segregation in the U.S. armed forces. He traveled the country speaking out after the launch of the Congress of Racial Equality in 1942. Years later, he was arrested for refusing to appear before the draft board as a conscientious objector, serving 26 months in prison. Even within jail, he angered authorities with desegregation protests and open homosexuality. Rustin continued his advocacy into the 1950s, when in 1953 after delivering a speech in Pasadena California, Rustin was arrested for “lewd conduct,” a sexual act involving men. This arrest provided fuel for the FBI’s growing file on Bayard Rustin, and also created a wedge between Rustin and other activists that did not want him affiliated with their movement. In the mid 1950s, Rustin went to Alabama to support Dr. King and the Montgomery Bus Boycott. He stayed out of the spotlight, but introduced King to Gandhi’s teachings while organizing carpools and writing materials. He also helped to organize the Southern Christian Leadership Conference in 1956 and 1957. Despite his successes, Rustin was threatened and criticized by other leaders, such as Rep Adam Clayton Powell, who threatened King that he would tell the press that he and Rustin were gay lovers if he continued to organize with him. This strategy to malign Rustin was used in 1960, when King and Rustin were planning a march by the Democratic National Convention in Los Angeles. 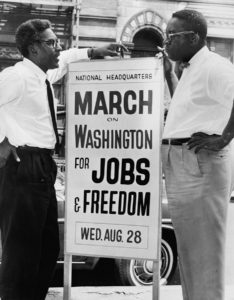 In 1962, A. Philip Randolph, a labor and civil rights organizer, recruited Rustin to help with the March on Washington, wanting to ensure that economic issues, as well as civil rights, were part of the platform. Rustin traveled back to Alabama to meet with King and began organizing with other coalitions and movements such as the National Urban League, the NAACP, and Southern Christian Leadership Conference. However, Rustin’s sexuality came into play again, when Roy Wilkins of the NAACP refused to allow Rustin to be the front man. It was decided that Randolph would serve as the March’s director and Rustin would be his deputy. The 1963 March on Washington would go on to be hailed as one of the most monumental nonviolent protests in history, and no title change could take away Rustin’s contributions to it. As a gay man in the Civil Rights Movement, Rustin was forced to be in the shadows. Despite all attempts to silence him, he is recognized as being the key organizer behind the March on Washington. Rustin’s influence on other civil leaders, such as Martin Luther King, has made its mark on history, and Bayard Rustin is a name we should hold dear and remember.